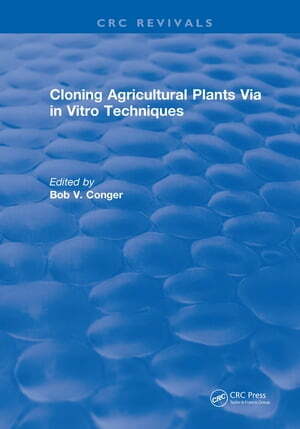 Collins Booksellers - Cloning Agricultural Plants Via in Vitro Techniques by Bob V. Conger, 9781351087605. Buy this book online. The purpose of this book is to provide a reference guide on principles and practices of cloning agricultural plants via in vitro techniques for scientists, students, commercial propagators, and other individuals who are interested in plant cell and tissue culture especially its application for cloning.Plant cell and tissue culture generated much excitement during 1970?s concerning the potential application of the technology for improving important agricultural crop plants. This originates from the demonstration of cellular totipotency, or the ability to regenerate whole plants from single cells, and the successful creation of hybrids by somatic cell fusion in some species. There are several areas of in vitro culture which have potential practical application. The most practical application is deemed as cloning or mass propagation of selected genotypes. This is evidenced by the large number of commercial firms engaged in propagating a variety of plants through tissue culture.